On In The Dark. 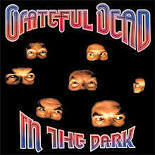 Was the first of two encores during Grateful Dead's very last show at Soldier Field in Chicago on July 9, 1995. First line (and overall theme) come from Thomas Moore's poem The Last Rose Of Summer (1805), set to music by Sir John Stevenson. That musical similarity also ripples through some way.